The Wii U has always been a video game console first and foremost, as opposed to its competitors which have branched out to have other multimedia functions in addition to playing video games. Though there's something to be said about the console being 'focused', it does feel like a bit of a letdown that there aren't too many apps on the eShop that serve other useful functions that aren't necessarily game related. Fortunately, this has changed somewhat in recent times, as Rhapsody has just announced that it's produced an app for the Wii U eShop. We know that close to 91 percent of all Americans listen to music more than 24 hours a week. 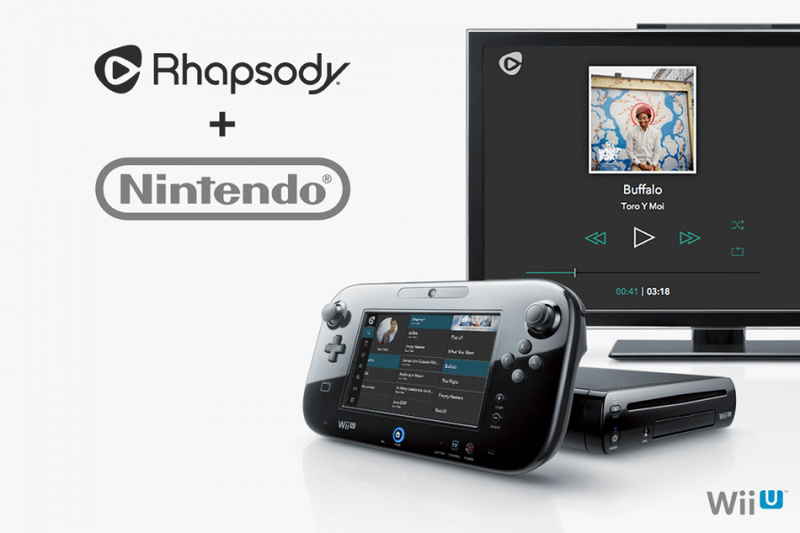 We're honored to partner with Nintendo to bring music to Wii U users, and continue Rhapsody's goal of making it easy for people to listen to the music they love wherever they are. What do you think? Do you use Rhapsody regularly? What other apps would you like to see developed for the eShop? Share your thoughts in the comments below. I'd rather play games and watch videos on my Wii U, and play music from my phone, so this is not for me. People are actually going to use this? Wow. This works for me as it will free up my phone. Napster has been available on the Wii U for months. A bit late in the WiiU life isn't it? If they would include Spotify (which is currently PS4 exclusive), I'd be interested. Otherwise... no. I haven't used Rhapsody in...ten years, maybe more? Still, it's good to see options for media apps on the Wii U. They should have added this sooner. First? What about Napster which is already out? I wish we got Rhapsody: A Musical Adventure from Nippon Ichi instead. I sold my Playstation copy quite a while ago. I didn't know that Rhapsody was still a thing, I thought that fell into obscurity a decade ago. So... They assumed we don't listen to music? Not to mention, it'd be useful if we could play our music while playing games. If this doesn't offer that ability, then its a wasted effort that'll go in the same pile as the rest of them that don't. yes, I very much agree. It would be nice if something let us play our own music in game. I have a Bluetooth speaker that cranks with a sub that is for my phone and music. why turn on my wii u, tv, surround system just to listen to radio. my wii u is for gaming. I even have a Roku to use so we don't use Netflix on it. Rhapsody is still a thing? Trust me, nobody is listening on it. Welcome addition since I got it free from T Mobile so I will be sure to log in sometime and check it out. @MitchVogel "The first music streaming app for Wii U"
The borders of the world stretch beynd the USA ya know... we already have two music streaming apps in Europe. "We know that close to 91 percent of all Americans listen to music more than 24 hours a week. " No way. I mean does this count like jobs where you are working and someone has a radio playing to loudly? I'd love to see the details behind this BS stat. Oh, and my WiiU is for games. Not music. It only gets used for Netflix when my sons or wife is around. If it's just me, it's gaming time. Eh, I'd just use Pandora on my Roku if I wanted to listen to music through my TV (it's free). I do most of my listening on either the radio or my phone anyway. @Ibberson Is true, I have it and is pretty cool. It'll always bother me that they add this, and hulu, amazon video, netflix, but not let you use DVD's, blurays etc. Maybe I'm misremembering but I remember being told the reason Nintendo decided to not have the wii play DVD's was because they wanted it to be focused on games not being a multimedia machine. I'm sure that the comments thread is already chock-full of neurotic whining and fanboying over Pandora, which is in my opinion a far inferior and barebones service, so here's my assessment of the Rhapsody service after I've started using it since last night. First off, when I compared the interface of the Wii U's version of Rhapsody to the PS4's version of Spotify I found that the former is far, far, FAR superior in every way. For one, the gamepad is used strictly for finding music and navigating your library as well as playlists. I'm still getting used to using the game pad for navigating as searching for music is done strictly through the touch screen and the buttons are reserved for pausing, skipping and repeating tracks. Spotify on the PS4 requires that you strictly use the controller to navigate the app and type in what you're looking for. I don't know about you, but touch typing for me is far more convenient than D-Pad+Face-Button navigation. Secondly, when comparing the songs and services offered by Rhapsody and Spotify there are some differences. Rhapsody can virtually match Spotify's music library track for track. I'm in the middle of recreating my 345-song playlist from my Spotify app and 100 songs in I've been able to find each and every song so far, but that's where the similarities end. Spotify bests Rhapsody when it comes to free services as you can listen to what you wish with ads on the PS4, whereas with Rhapsody there's no accessing the service unless you have a subscription. Luckily, when you sign up for the Rhapsody service through the Wii U's app you'll get the free trial for a month and it'll be $9.99 per month afterward. Spotify, on the other hand, is free with ads but $12.99 afterward and with limited access if you're trying to share your account with others. The mobile apps are a different story, of course, but for the sole purpose of this assessment I'm focusing on using each respecting app on their respective systems. The verdict? Rhapsody on the Wii U trumps Spotify on the PS4. @Judgedean on the Us eStore or exclusive to else where? I am actually very happy about this. T-mobile gives you a discount on Rhapsody so I switched from Spotify while back. No other devices I know of run Rhapsody. Don't know how often I will use it since it is just as easy to stream from my PC, but cool! Also Toro Y Moi is awesome. This isn't the first music streaming app on the Wii U. Napster was released on the Wii U a few months ago. "Though it may not be quite as prolific as Spotify or Pandora, Rhapsody (Napster, for those of you outside the US)..."
@andrea987 : Thats true. Personally i use Spotify. I'm surprised that there is no Google Music app for Wii U, because Google Street and YouTube were on Wii U at launch. @Uberchu On the UK eStore. Is it possible to play during gameplay? @kensredemption Thanks for your great review, I´m subscribed to a couple of music streaming services, I have Spotify on the PS4, and while I love the service in my computer and Phone/tablet, the PS4 version it´s not very user friendly as its counterparts, BUT the selling point for me is the ability to listen to music while playing games (a soundtrack overlay so to speak) I love doing this on my PS4. You don´t mention this in your review, can you do it with Rhapsody on the wiiU? @whitemaskedhero In Excite Truck for original Wii, you can put up to 100 MP3 files on an SD card and either set a song for each course or just have the music randomized during races. The latter is what I do. I just wish you could change the menu music, though.